Chilli-turmeric crispy oven-baked Potato wedges. 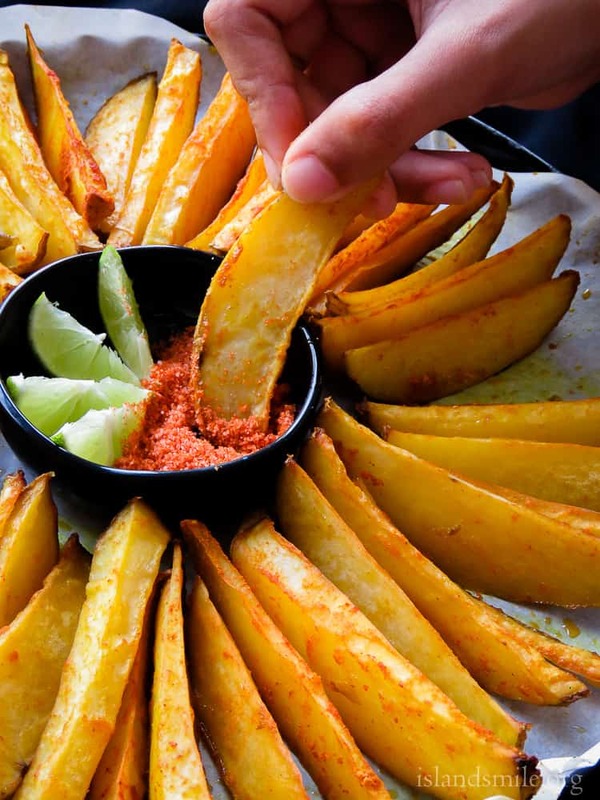 Oven-baked Potato wedges mixed with chilli and turmeric, you have the ingredients to make these spicy potato wedges, go ahead and make them now. they make a great instant snack when you crave for something spicy. Crunchy on the outside, soft in the inside, spiced up with turmeric, chilli powder is how I’ll describe these oven-baked potato wedges. They are way too good to stop with one or two wedges so make extras and avoid the disappointed looks if what you’ve made is not enough. 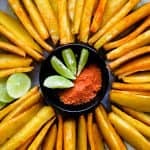 People have different tastes, some like sweet stuff as their snacks but if you are a lover of super spicy Mango achaaru(I’m imagining all my Sri Lankan readers nodding their heads here)or spicy snacks and bites, then you are going to love these potato wedges. especially when you serve it with a bowl of salt and chilli powder mix. Did I mention how easy they are to make? what you see in the image is exactly how I served them, just right out of the oven, no clean up, no extra bowls. I honestly wouldn’t advice meddling with the potato wedges once they are done, just transfer from oven to table so they are still warm and crunchy and serve them with a small bowl of salt and chilli powder, this is what’s going to elevate these every day Potato wedges to a great snack. Usually, my kids are the first to taste a recipe but since my mom and brother were there and they especially loved it, if done right these crispy potato wedges will definitely be a very popular with your family. Along with the salt and chilli mix, don’t forget to serve a few slices of lime, squeeze a tiny drop of it over the wedges and you’ll be surprised how good they taste. yum ! 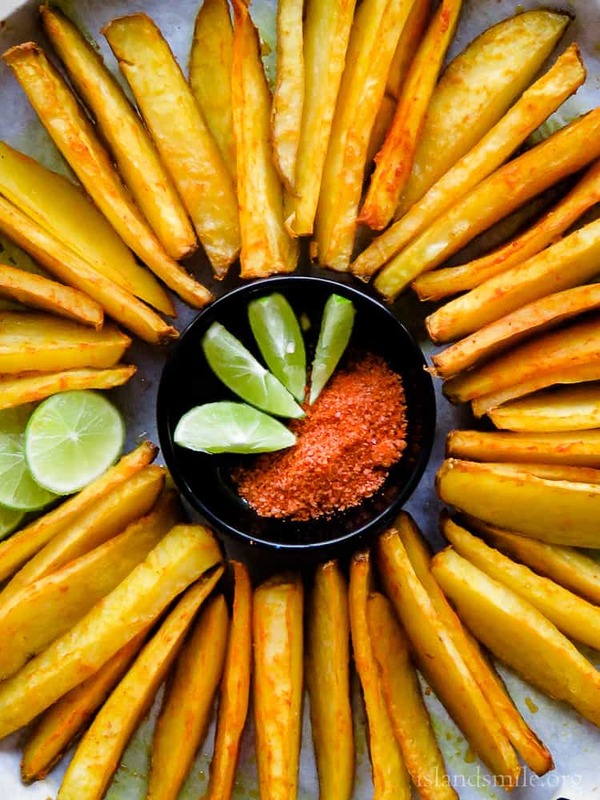 For more recipes like this chilli-turmeric crispy oven-baked Potato wedges. remember to subscribe to islandsmile food blog and get your fix and helpful recipes for your family delivered to your inbox. You can also find and follow me on Facebook, Twitter, Instagram and Pinterest. 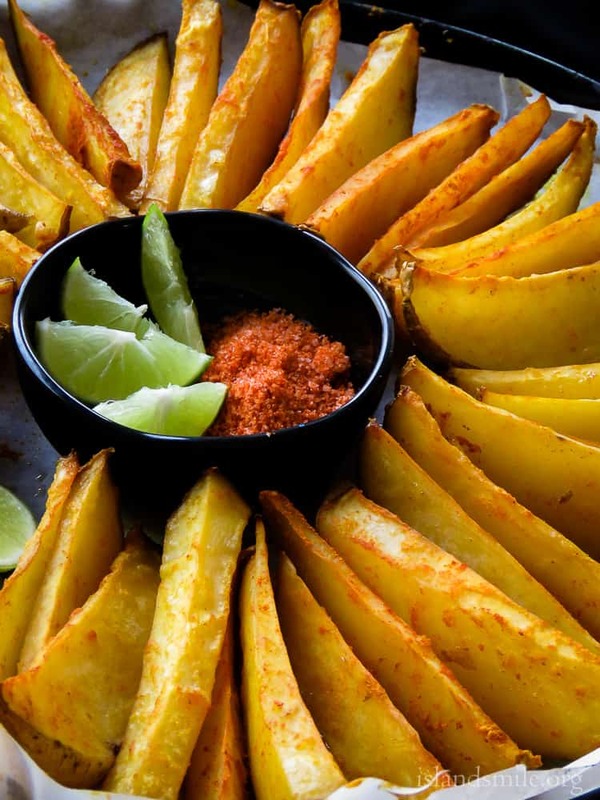 recipe- chilli-turmeric crispy oven-baked Potato wedges. Scrub the Potatoes well and wash off any mud remaining on potato skin. Pat dry with paper towels. Cut the potatoes into wedges, making sure the bottom with the skin is wider(not too thick, not too thin) so they stand upright as shown on the images, think how you would cut an apple where closer to the skin the wedge are slightly wider, cut the potatoes the same. Place the Potato wedges in a glass bowl and microwave for 3-4 minutes to take out extra moisture. 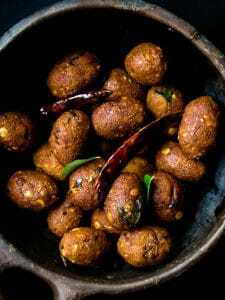 Once microwaved, transfer the potato wedges into a large bowl or pan, pour in the oil over the Potatoes, followed by turmeric, chilli powder and salt to season. Cover the bowl with a flat lid or plate and shake vigorously, make sure all the wedges are evenly coated with chilli powder, turmeric, oil and salt. Taste to check if the seasoning of Salt is adequate. Prepare the baking dish by covering it with parchment paper and brush with a thin coat of oil. Spread the potato wedges as shown on the picture with the wedges standing on their skin to the baking dish. if you’ve cut the wedges as mentioned above, they should stand alone. place them together, so even if you slice a few thin wedges, they can lean on to the thicker potato wedges. Place the baking dish with the potatoes in the oven and bake for 25-30 minutes. 20 minutes into baking,take out the tray and lightly brush oil over them and return the wedges in to the oven and continue baking. You will have no need to flip them over but once 30 minutes are over check on the potato wedges, use a fork to check if they are cooked through, if you find them less crispy, continue to bake for another 10-15 minutes more. Serve immediately with your favorite dip or a bowl of salt and chilli powder mixed together. You will have no need to flip them over but once 30 minutes are over check on the potato wedges, use a fork to check if they are cooked through, if you find them less crispier than you like, continue to bake for another 10-15 minutes more.